One of the most frequent questions PA Senior Medicare Patrol (SMP) staff receives is “What happens after I report Medicare fraud?” Well a few things can happen, and it also depends on who receives the complaint. SMP staff will counsel individuals who want to report healthcare fraud and abuse. We take the steps to file a report and also gather information needed (i.e. copies of Medicare Summary Notices or medical bills) to start an investigation. Depending on the area of healthcare and part of Medicare, it can vary which investigative entity will open a case. Most often cases go to either one of two agencies –the Centers for Medicare and Medicaid Services (CMS) or the Office of Inspector General (OIG). How CMS Handles Complaints. When a beneficiary calls 1-800-Medicare to report an issue, their staff will determine if this was an error, abuse, or outright fraud. Also how the complaint is handled is based on the part of coverage including Original Medicare (Parts A & B), Medicare Advantage (Part C), or a Medicare Prescription Drug Plan (Part D). If a discrepancy is reported because of error on the part of the provider when submitting a claim for service under Original Medicare, a Claims Processing Contractor, also known as a MAC (Medicare Administrative Contractor), is going to look into the issue. In the case of a Medicare Advantage or Part D plan, most often that individual plan will investigate the reported error. If it is a case of suspected Medicare abuse (Definition: A provider committing incidents that are inconsistent with accepted sound medical, business, or fiscal practices. 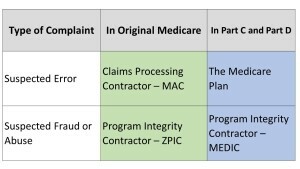 For example, a pattern of improperly submitting claims), and the services fall under Original Medicare, they are sent to a Zone Program Integrity Contractor (ZPIC). They will investigate the complaint. Possible investigation outcomes can include educating the provider on what is needed to properly process a particular claim, issuing a warning, or ordering the provider to return funds that Medicare paid. 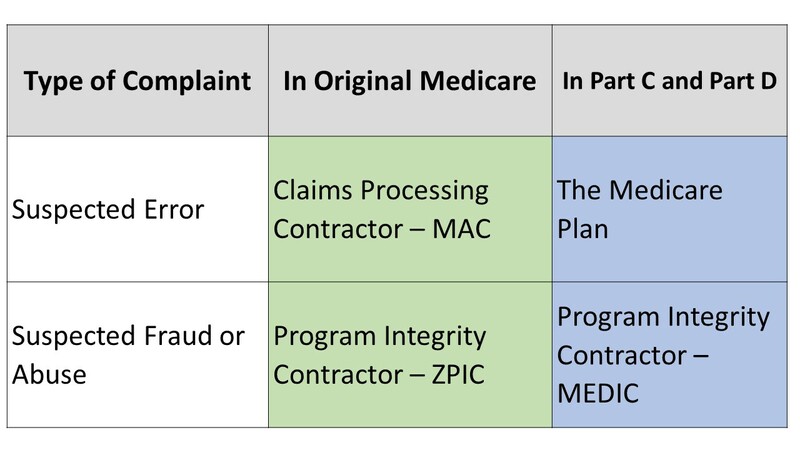 If the suspected abuse occurred under a Medicare Advantage or Part D plan then the National Medicare Drug Program Integrity Contractor (MEDIC) is going to investigate and possibly take the same actions as their counterpart ZPIC. Here is an illustration for a closer look: The OIG and Medicare Fraud Complaints. More often, if patterns of abuse arise on the part of a provider or in cases of outright fraud, CMS will likely refer those cases to the Office of Inspector General (OIG), the investigative entity for the Department of Health and Human Services. The OIG will partner with other federal agencies like the FBI, Medicaid Fraud Control Units, and United States Attorney’s Office when investigating healthcare fraud. When SMP refers a case to the OIG, the SMP is typically not informed of the progress of the case, and it can take years to reach an outcome. Case example: In 2011, the SMP forwarded information to the OIG about a Philadelphia area podiatrist who had billed services to Medicare that beneficiaries never received. In October 2014, SMP staff read a press release from the Department of Justice and discovered this particular provider’s indictment for swindling approximately $450,000 in Medicare funds. Our staff only learned of this because we follow email updates of press releases from the OIG. This is a sobering example that healthcare fraud investigations take time. When the OIG and partnering agencies investigate fraud, there are a number of possible actions that can happen. The OIG can pursue criminal or civil prosecution, seek administrative sanctions which bar a provider from billing Medicare, impose monetary penalties, or have a provider enter a corporate integrity agreement. At the OIG’s website , they list the latest enforcement actions, post consumer alerts, and maintain the excluded providers’ database. There is also an opportunity to subscribe to email updates. If you have questions about Medicare fraud, please contact the PA SMP at 1-800-356-3606.